Definition of Table. A systematic arrangement of data usually in rows and columns for ready reference. 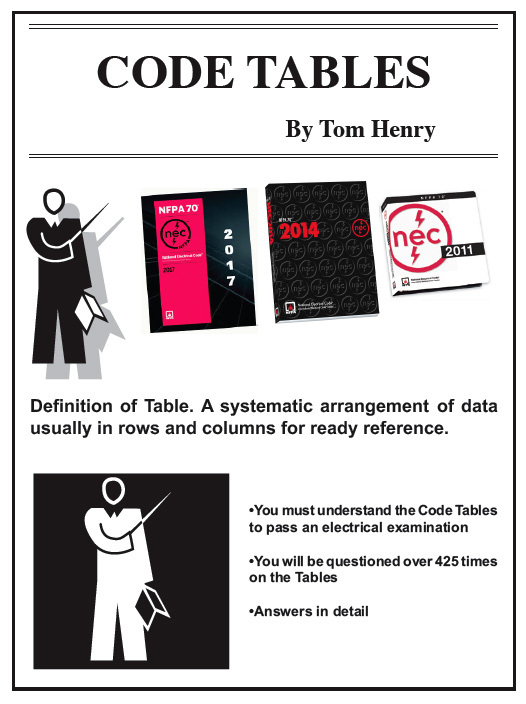 Understanding the Code Tables is very important to the reader of the book preparing to take an electrical exam. During my journey traveling 21 states, 84 cities preparing electricians for their license exam, I've experienced the weakness the student had in applying the Code Tables. Some have missed passing the exam by one or two points merely by being unfamiliar with the Code Tables and how they are applied. Yes, some exam questions are difficult even to the experienced Code person. I know in my preparation for the exam years ago I missed the tough ones also. But, the key to passing the exam is miss the tough ones in class or in your homework, not the day of the exam. I've always felt the advantage I had was when I missed one I said to myself, "you got me on that one, but you won't ever get me again on that one." My experience in preparing over 20,000 for the exam over the years is I have found several students continue to miss the same question over and over. I've given them the question in the afternoon of class and explained the Code reference and answer, and for homework that evening I've included the same question and they missed it again even though approximately five hours earlier the answer was explained to them. This has to be corrected in order to pass the electrical exam. in the Tables and notes and mark the key words that will take you to the correct answer.